WELCOME TO 10 LEO AVENUE, BUILT IN 2004 THIS OPEN AND BRIGHT COLONIAL OFFERS NEW CARPETING, AND HARDWOOD FLOORS ( 1) YEAR, CENTRAL AIR, OPEN KITCHEN/LIVING ROOM HAS A BEAUTIFUL FLOW, KITCHEN OFFERS LOTS OF CABINET STORAGE, COUNTER SPACE, WHICH OPENS TO DINING AREA, NICE LARGE FAMILY ROOM, MASTER SUITE ON 2ND LEVEL, WITH 2 ADDITIONAL GENEROUS SIZE BEDS, AND ANOTHER FULL BATH. PLENTY OF CLOSET SPACE. FINISHED LOWER LEVEL HAS BUILT IN ENTERTAINMENT CENTER AND DRY BAR PERFECT FOR ENTERTAINING. INTERIOR BASEMENT ACCESS ONLY. SLIDERS OFF KITCHEN, TO NEW DECK, OVERLOOKING FULLY ENCLOSED PRIVATE COZY FENCED YARD. ***THIS HOME IS VERY CENTRALLY LOCATED MINUTES FROM ALL INTERSTATES, NORTH & SOUTH. IF DRIVING CONVENIENCE IS ON YOUR CHECKLIST, THEN THIS HOME IS FOR YOU!! 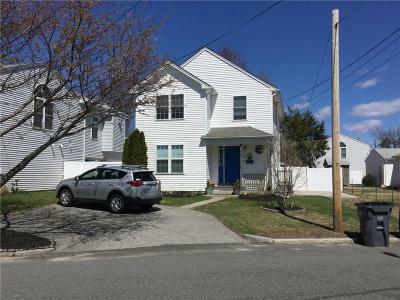 CLOSE TO ALL SHOPPING, COLLEGES, MINUTES TO THE EAST SIDE OF PROVIDENCE. HURRY SPRING IS HERE AND IT IS A GREAT TIME TO BUY! SUBJECT TO SELLER FINDING SUITABLE HOUSING.